The Write Question is a weekly video podcast all about writing. 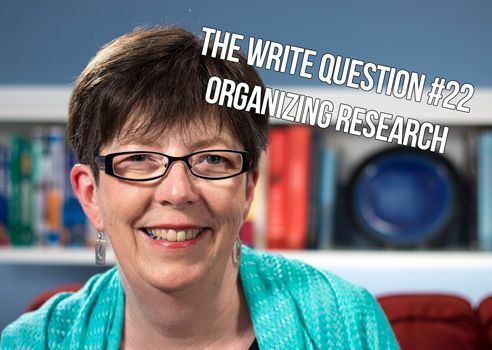 Today’s question focuses on how graduate students can better organize their research. Welcome to The Write Question, the video podcast designed to answer your questions about writing. I’m Daphne Gray-Grant. Today I’m answering a question about research from Master’s student Jonneke Jorissen, who lives in the Netherlands. Here’s the question. [recording] I have found it very important to first do my research and then start writing in contrast to what I have been told — to start writing as soon as possible. But I’m struggling to organize my materials. I have found that if I just summarize what I read and put it in a big pile, it’s hard to find what I have summarized later on, when I need it. I also find I tend to forget the things I have already read. So, I’m wanting to ask you if you have any tips on how to organize your material. Thanks for the question, Jonneke. I have three tools I can suggest for anyone writing a thesis or a book. The first tool is Evernote. This remarkable piece of software is the best tool I’ve ever discovered to organize research and keep it trackable. Evernote is a web-based system that started operating in California in 2008. By 2016, it had some 200 million users. There are Evernote versions for both PCs and Macs and you can even install it on mobile devices so you have access to it all the time. Evernote allows you to save notes. These notes can be anything — a web page a document you’ve scanned, some information you’ve scribbled to yourself in a Word document. You can then store these notes in digital notebooks. I created about a dozen notebooks when I started using Evernote. But it didn’t take me long to realize I was creating way too much work for myself. You’re far better off if you keep the notebooks to a minimum and focus instead on your tags — they’re little labels you apply to each note. Regarding tags, I suggest you use a lot of them. I try to assign at least three tags to every note and double that for some important ones. This gives me multiple entry points. If I don’t remember one of the tags, I’ll likely remember another. The best other thing I like about Evernote is that it allows you to save webpages with a single click. It took me about a week to get used to using Evernote. But it’s been a very worthwhile investment. The basic service is free — until you hit the monthly upload limit of 60 MB. But when I decided to become a serious user I didn’t object to the affordable annual fee of $89.99. I swear Evernote is not a sponsor of this video, I just really love the app. The second tool I want to suggest is starting a research diary. Every day you research, take a brief bit of time to flip through what you’ve read and write your own REFLECTIONS on it. This is not just a summary of what the other researchers and academics have said. Instead, it’s your REACTION to this information. You can even file these notes in Evernote as well. The big benefit of keeping a research diary is it will get you thinking and writing early in the process so you’re less likely to suffer from writer’s block. The third tool I suggest you use is mindmapping. I talk about mindmapping a lot so I won’t dwell on it here. But it’s a really useful way of inspiring yourself to write when you get to that stage. I’ve included some links below that will explain the hows and whys of mindmapping. Thanks for your question, Jonneke. Good luck with organizing your research and earning that coveted degree.